1. To affirm the opposite of; to state what is untrue or erroneous; to deny categorically: There was a rumor going around that Susan was going to marry Steve, but she contradicted that right away! They weren't going to be married. They were just friends. 2. To be directly opposed to a statement or an action; to go against: Jim's mother was contradicting herself because; first she said that he could go to the movies with his friends, then she said he could not go! 3. 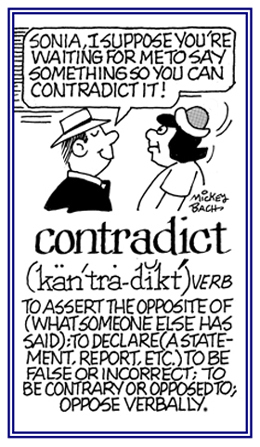 Etymology: from Latin contradicere, "to speak against"; from contra-, "against, opposite" + dicere, "to speak, to say". © ALL rights are reserved. 1. Characterized by asserting or expressing the opposite of a statement which was made previously: Mike was being so contradictable by first saying one thing; then an hour later, he was denying it! 2. Descriptive of being inconsistent about or being inconsistent with: The witnesses were giving contradictable information, each one describing the accident in a completely different way. 3. That which can be argued against; such as, the truth or correctness of someone's statement or claim about something: James told his friends that his mother was going to have another baby; however, it was a very contradictable statement because she was not pregnant! 1. The action of speaking against or in opposition to an action, a proposal, etc. : During his talk in class, Tim's arguments for saving electricity was in complete contradiction to the daily use of desktop computers for all of the students in class. 2. The action of declaring that something is the opposite of what was indicated previously: There was a complete contradiction of what Michael's father said yesterday and then today; because, first he wanted to go on vacation with the whole family, but now he says that everyone will have to stay home because there isn't enough money for a trip! 3. A state or condition of opposition in things compared; a variance or an inconsistency: Susan became a vegetarian because she was against killing animals for human use, but the contradiction to this belief is that she wears shoes and a jacket made of leather! 4. A statement or phrase which is presented in terms that are the opposite of each other: Some examples of contradictions are "fair taxes, working vacation", and "true fiction". 1. Relating to having the quality or character of denying that a thing stated is completely true: The students in class gave contradictory stories about the fight that took place outside on the playground. 2. Pertaining to being inconsistent in itself; containing elements opposed to each other: The people who saw the accident happen gave contradictory accounts to the police, each one saying something different. Kate gave contradictory statements regarding where she was when the thief stole her money; first, she said she was in the store, then she claimed that she was in the park. 1. To suggest the inadvisability of something; for example, a medical treatment: Certain medications are contraindicated during pregnancy because of the danger they can pose for the unborn baby. 2. To make a treatment or procedure unacceptable because of a particular condition or circumstance: Some specific exercises in the fitness studio are contraindicated for people with heart problems. 3. Etymology: from Latin contra, "against" + indicere, "to proclaim" from Latin indicare, "to declare, to dictate". Characteristic of anything that has been suggested as possibly harmful; such as, a warning against a specific medicine or treatment: Because of Amy's heart condition, the doctor specifically advised her not to take the contraindicated drug. A reference to the inadvisability of having certain medical treatments: Some patients have contraindicative conditions that can make it much more risky and unwise for doctors to pursue certain types of treatments. 1. To give up earnestly, seriously, or wholly, to a particular person or specific purpose: The orchestra dedicated all of their evenings practicing their new compositions for the concert. 2. To inscribe or to address a book, an engraving, a piece of music, etc. to a patron or a friend, as a compliment or a mark of honor or affection: Joy Fielding dedicated her book Heart Stopper to Shannon Micol, a person whose music inspired her very much. 3. To set aside, to specify, or to preserve for a specific purpose: The money that the city received was dedicated to building a much-needed bridge. 4. To open formally to the public; to inaugurate or to make public: The children played baseball in the city park which was recently dedicated by the mayor. 5. Etymology: from de-, "utterly, completely" and dicare, "to proclaim, to tell, to say". 1. The giving up or devoting (of oneself, one's time, labor, etc.) to the service of a person or to the pursuit of a purpose: It is said that dedication and imagination are two very important components to accomplish a goal. 2. The official statement at the beginning of a song or a book, for example, to show the devotedness for a particular person: The book The Ra Expeditions by Thor Heyerdahl has a very short and precise dedication: "To Yvonne"! 3. The act of the authorized opening of a building, a highway or a swimming pool for public use: The dedication of the first swimming pool in Sally's town took place in the summer when it was very warm and the public could use it right away. 4. An act or process of setting something aside for a particular purpose; especially, in a ceremony that achieves this: The dedication service at the new church showed the commitment of its members to have their place of worship. A trademark for a small hand-held tape recorder used to register spoken words which were to be written down exactly as they had been recorded: In the past when dictaphones were being used, Mary's grandfather needed to have a device to record the notes he was saying out loud and he used a dictaphone for this purpose. 1. To put into words that which is to be written down; to utter, to pronounce, or to read aloud to a someone that which he or she is to write: The director dictated a letter to his secretary which she had to put into perfect format on her computer. 2. To prescribe a course or an action for an objective; to lay down authoritatively; to order, or to command in stipulated terms: The military commander who won the battle dictated the terms of surrender to the side that lost the battle. 3. To tell someone else what to do; to lay down the law, to give orders: The older, more experienced teachers, did not like being dictated to by the new principal who was young and with much less experience in the school's administration. 1. The pronunciation of words that are to be written down: The teacher checked over the dictation once more to make sure that her English students would be able to understand everything when it was read aloud to them. 2. The activity of taking down a passage that is presented by a teacher as a test of spelling, writing, or language skills: The dictation was presented orally by Mrs. Smith because she had to see how well the students in her class studied their vocabulary lesson! 3. An arbitrary command; the exercise of absolutism: The dictations of her common sense told Sharon to leave the violent area at once! 4. The action of giving orders authoritatively or categorically: The dictations given by the leader of the tour were very strict and left the participants wondering if they were in the right group! 1. A person exercising absolute authority of any kind or in any sphere; one who authoritatively prescribes a course of action or says what is to be done: When a country is run by a dictator, he or she has total and complete command over the people and can often be very cruel. 2. A person who tells a writer what to put into print: When Johann Sebastian Bach was very old and became blind, he acted as a dictator when he told his son-in-law to write down the notes for his music. Showing page 3 out of 10 pages of 150 main-word entries or main-word-entry groups.